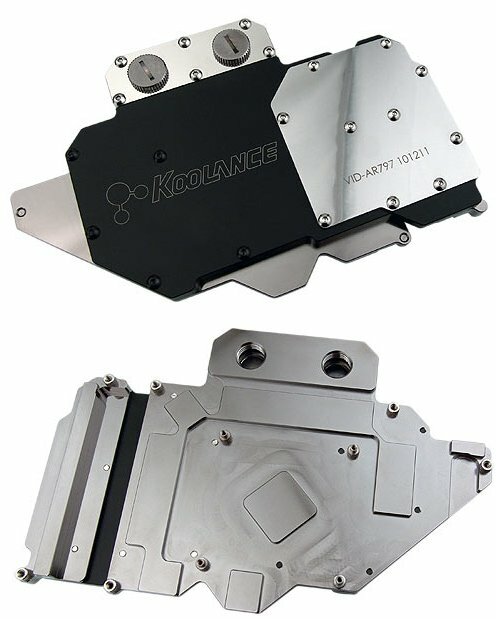 Koolance announced the VID-AR797, a new waterblock for AMD's Radeon HD 7970 reference model graphics card. It will start shipping on January 16 with pricing of $122.99. Full specifications over here. The Koolance VID-AR797 is a full coverage video block for water cooling AMD Radeon HD 7970 cards in single and multi video card configurations. It utilizes a high-performance microfin (0.5mm) design made of solid copper with anti-corrosive nickel plating. Nozzle threading is standard G 1/4 BSP. For CrossFire configurations, Koolance connect nozzles are also available.